- Discover the Alhambra of Granada in a perfect way with this guided tour. - Visit the Moorish monument without waiting in long queues. - Transport isn,t included. Tour will beggin in Welcome Center of Granavision. Alhambra is not just Nasrid Palaces. 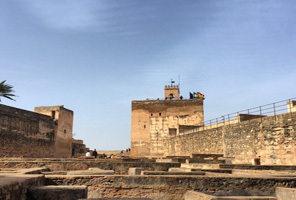 Time and Pick-up place: The meeting point will be at the Granavision Welcome Visitor Centre, next to the Alhambra (just 100 meters from the Car Park N1, next to Guadalupe Hotel), at 11:00 am. Although the tour will start from 11:00am, our Reception Centre is open from 8:30am, so we recommend you go early in the morning, so you can find out information about tourism offers in the city, enjoy our reading spot and free Wi-Fi area or have breakfast in the cafe while the children have fun in the playground. Our greatest wish is that your day in Granada starts in the best way possible. (1) We provide you with Alhambra tickets for the entire monument, no queues, no waiting. It will be given to you at the start of the visit. (2) An official guide will accompany you throughout the morning and help you to discover the history and secrets of this enigmatic monument. - If you want to modify or cancel your booking, please contact us with the customer form. After completing the purchase process your booking will be automatically confirmed. You can pay with your credit card (VISA and MasterCard) or bank transfer. You will receive your email confirmation of booking and the voucher of the visit once you have completed the payment. This voucher must be printed and showed to our official guide before the beginning of the guided tour to receive your tickets.